Who says couples have all the fun? 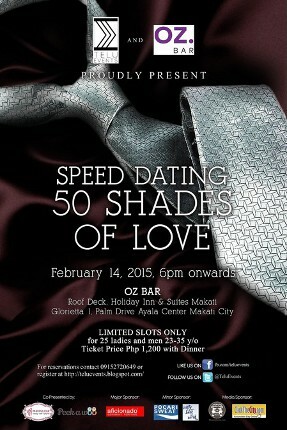 (SPOT.ph) Just because you’re single doesn’t mean you have to miss out on the Valentine’s fun. There’s plenty to see and do in the metro on the day of love. From parties to film festivals and shopping bazaars, we’ve rounded up 10 activities that prove you don’t need a significant other to enjoy February 14. Grab your friends and go on a movie marathon. Head to the Instituto Cervantes theater at 2 p.m. to catch a free movie screening of Romance, which tells the story of two actors who fall in love while acting in a stage adaptation of Tristan and Isolde. Not up your alley? 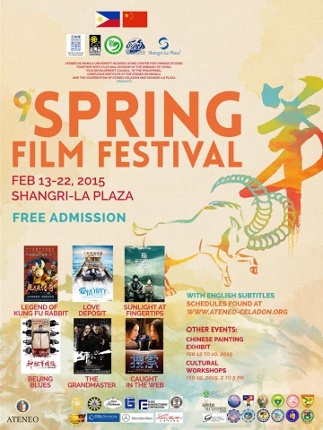 Make your way to Shangri-La Plaza Cineplex at 12:30 p.m. onwards to watch free screenings of Chinese films at the 9th Spring Film Festival. Or you can just catch the highly anticipated Fifty Shades of Grey in the cinemas. Don’t spend Valentine’s Day moping around. Let loose with Joey Ayala and the awesome folks at Silly People’s Improv Theater (SPIT). 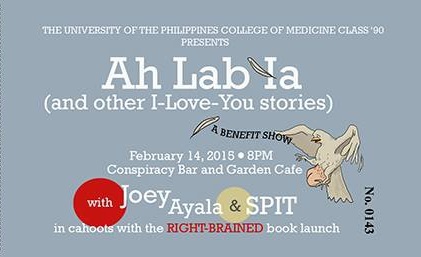 Ah Lab Ia is their special charity show that well, celebrates the funny and relatable moments of love. Drop by the Conspiracy Bar and Garden Cafe at 8 p.m. for a night of laughs. Conspiracy Bar and Garden Cafe is at 59 Visayas Avenue, Quezon City. For more information, call 404-2348 or 0917-843-3549. 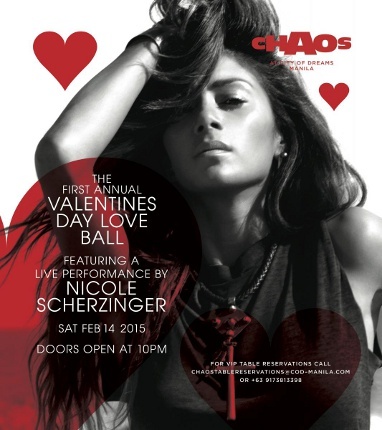 Drink and party the sad, single feelings away at Chaos night club’s first annual Valentine’s Day Love Ball, featuring a live performance from Nicole Scherzinger. Who knows, you just might meet someone new. Tickets are priced at P2,612 and doors open at 10 p.m. Chaos is located at City of Dreams Manila, Asean Avenue corner Roxas Boulevard, Entertainment City, Parañaque City. For more information, call 800-8080 or 0917-381-3398 (VIP table reservations). 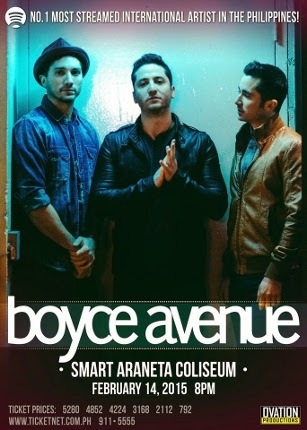 Make it a night filled with good music, and let Boyce Avenue serenade you and your friends at the Smart Araneta Coliseum. If you’re heartbroken, they probably have a song perfect for you and your feelings. Hurry, tickets are still available through TicketNet outlets and online. For more information, call TicketNet at 911-5555. 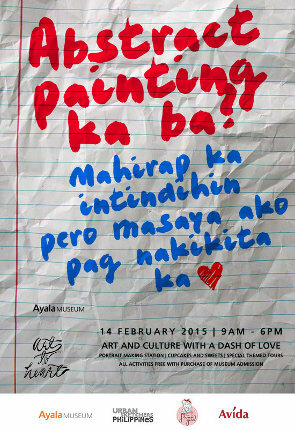 Ayala Museum is adding a dash of history and culture to the day of love with Art to Heart. Feast your eyes on the vivid display of colors at Cesar Legaspi: The Brave Modern, rekindle your love of country with the Philippine Diorama Experience, and more inspirational exhibits. The program also includes a fun portrait station and sweet, limited-edition cupcakes to commemorate your day. Register at 9 a.m. and be prepared to shell out P255 for adults and P125 for students and senior citizens. Ayala Museum is at Makati Avenue corner De La Rosa Street, Makati City. For more information, call 759-8288 local 35. Indulge in a little retail therapy at Le Souk’s Valentine Weekend Fair, and take a gander at unique finds from local crafters and artisans, premium brands, and more under one roof. Entrance is free and if you join the raffle, you might even get a chance to win some awesome getaway prizes. 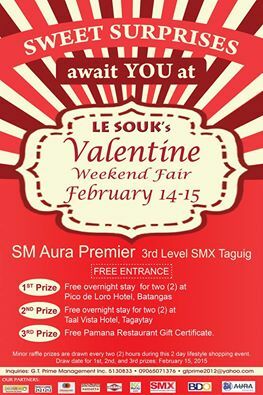 The Valentine Weekend Fair is at 3/F SMX Convention Center, SM Aura Premier, Bonifacio Global City. For more information, call 513-0833. 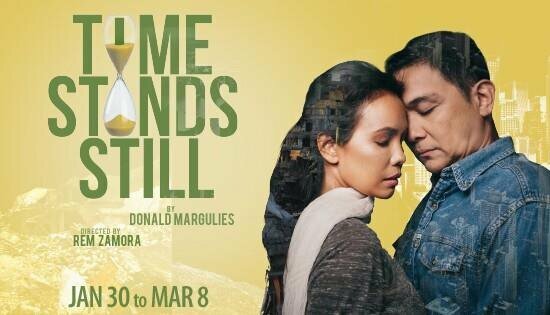 Get ready to see your feelings onstage at Time Stands Still, the story of Sarah and James, two journalists who return home after sustaining injuries in the Middle East, as they try to live an ordinary life together-with challenging consequences, of course. Not up for the heart-wrenching? Check out Defending the Caveman, a hysterical play on the stereotypical but indisputably true differences between men and women. Time Stands Still is at WhiteSpace Manila, Chino Roces Avenue Extension, Makati City. Defending the Caveman is at Carlos P. Romulo Auditorium RCBC Plaza, Sen. Gil Puyat Avenue, Makati City. For more information, call TicketNet at 891-9999. Looking to escape the dreaded Valentine’s Day entirely? 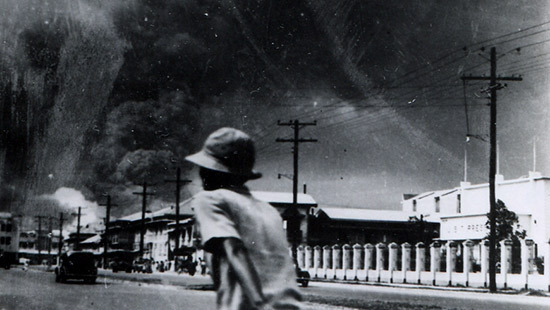 Head to Ayala Museum’s Manila: My City at War exhibit, which features the painful and eye-opening history of Manila at the height of the Japanese occupation during World War II. The exhibit includes artwork, photos, maps, and artifacts from the Battle of Manila. Admission fee is at P300 for regular guests and P150 for teachers, librarians, students, and senior citizens. Ayala Museum is at Makati Avenue corner De La Rosa Street, Makati City. For more information, call 759-8299. Feast your eyes on a spectacular fireworks display, courtesy of the 6th Philippine International Pyromusical Competition. Ticket prices are at P100 to P500, or cough up P1,500 for a patron seat, which also includes dinner. Tickets are on sale at TicketWorld, TicketNet, and the Pyromusical Competition website. 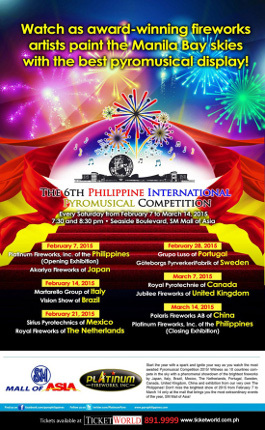 The Pyromusical Competition is at Seaside Boulevard, SM Mall of Asia, Pasay City. For more information, call TicketWorld at 891-9999 or TicketNet at 911-5555. Just because you’re single now doesn’t mean you always will be. Enter speed dating, which may just be your ticket to finding that special one. And if not, hey, at least it’ll be a memorable night for you and your friends. If you’re 23 to 35 years old, hurry and pre-register for a slot, and get ready to meet some new and interesting people. 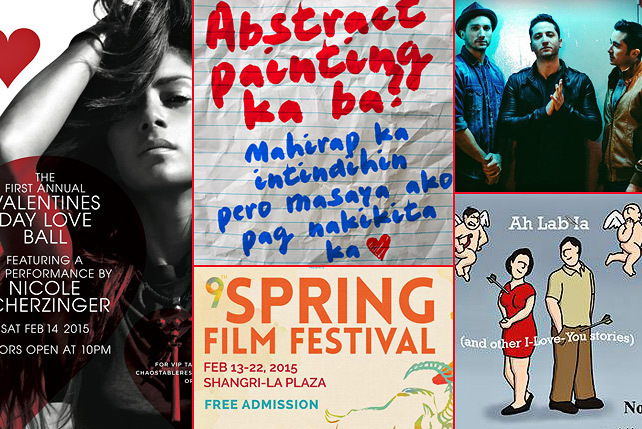 Tickets are priced at P1,200, inclusive of dinner and freebies. Oz Bar is at Roof Deck, Holiday Inn & Suites, Palm Drive, Makati City. For more information, call 272-0649.